EMU industrial production (excluding construction, the headline series) fell hard in December, harder than expected. The December month-to-month IP drop was less than in November, but after a puny gain in October and a plunge in November; another substantial decline in December was not what the doctor ordered or expected. The headline fell by 0.9%. Manufacturing output fell by 1%. Consumer goods output fell by 1.5%. Capital goods output fell by 1.5% and intermediate goods output was flat. This was after all sectors logged declines in November. The weakness in IP is no flash-in-the-pan. Looking at growth rates over three months, six months and 12 months shows a clear slippage into darkness. IP shows declines for all sectors and on all these horizons! The weakness is inescapable. What is worse is that the deceleration is gaining momentum. For the headline, the annualized pace for output's decline is deeper the shorter period for calculation and that is distressing. It says that forces of weakness are intensifying. For the three main sectors, consumer goods show this sequential deteriorating growth pace; intermediate goods hint at it with a small deviation in the six-month growth rate; the same is true for capital goods where the six-month pace is not as weak as the 12-month pace but then the three-month pace shows the bottom falling out. The fourth quarter (depicted in the QTD column since it is December and the quarter-to-date is now the full quarter) shows declines across all sectors in the EMU. Output for the headline series is falling at a 5.3% annual rate. For manufacturing, the drop is slightly less but still severe at -4.7%. The way lower is being led by capital goods where output is falling at a 6.7% annual rate in the quarter. That is a red flag since capital goods output tends to be less volatile, but it can take it on the chin in a recession. That signal is not yet being triggered here, but it is something to watch for. After December 2008, capital goods output in the EMU fell very much more sharply than the manufacturing index overall; thus, causing that ratio to drop by about 8% over the next year. The table shows aggregate manufacturing percentage changes across various periods for 11 EMU members and three other European countries. Among these 14-nations, seven show output month-to-month declines in December. Nine show month-to-month declines in November and six show monthly declines in October. 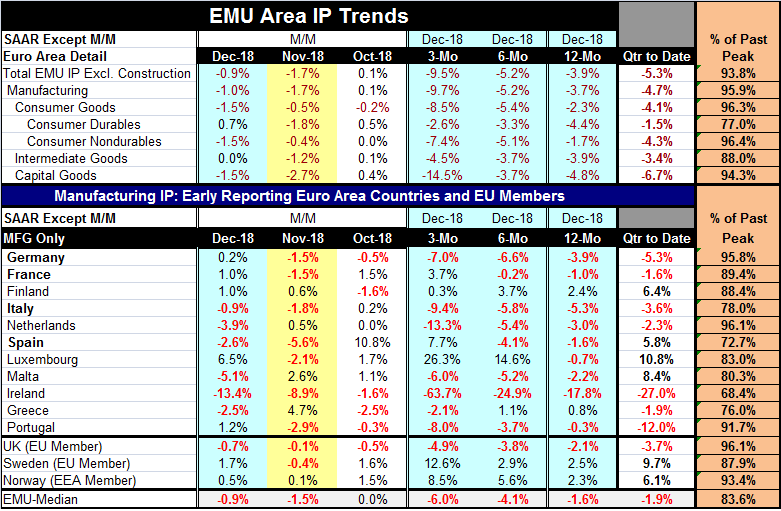 Looking at sequential growth rates over three months eight show declining IP; over six months nine show declining IP; and over 12 months 10 show declining IP. The Big Four economies of Germany, France, Italy and Spain mostly show output declines, but both France and Spain log output increases over the last three months. The country level data seem to show a bit less pervasive weakness than the sector data where output trends are in lock-step, weak and falling across the board. I calculate current output as a percent of this cycle's peak. For EMU members, only three countries Germany, the Netherlands and Portugal, have output as a ratio to its cycle peak at 90% or better. Four members are at 80% or better; they are France, Finland, Luxembourg, and Malta. Italy, Spain and Greece are at a ratio in the 70th percentile range. Ireland‘s percentile standing is at 68%. The other European countries in the table have standings in their respective 80th to 90th percentiles. On balance, there seems to be no sense of bottleneck and rather a more pervasive sense of output still having plenty of upside. Output is slipping because of slack demand. This in part is a reflection of the fact that output has been slipping for some months. Output in the EMU is weak and weaker than expected. The weakness is clear and not the result of any subjectivity. It is present across sectors and regions. Over time the weakness has been growing in intensity and it is beginning to play out as if the area is headed for recession because weakness is being led by contraction in capital goods. That is something to keep an eye on.